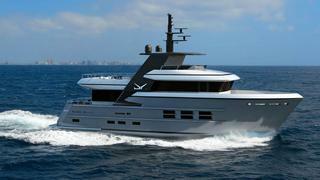 The new 24 metre Drettmann Explorer Yacht will be revealed at the Düsseldorf yacht show next year (January 23-31). 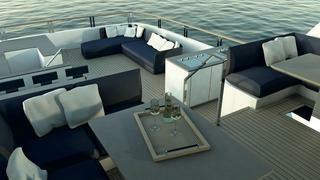 Ordered in 2013, it is the first of a new range of 24 to 45 metre explorer yachts from the German designers. The 175 ton steel and aluminium yacht has been built at Acico Yachts in the Netherlands and is the first of Drettmann’s explorer yachts to be built in Europe rather than in Taiwan. 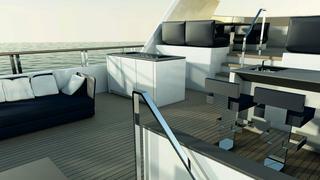 Exterior design for the series comes from Focus Yacht Design. Explorer yachts need to be able to travel long distances without refuelling. 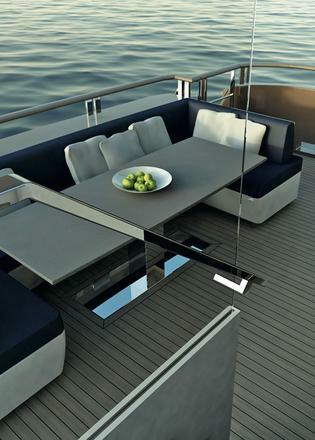 With this in mind the Drettmann Explorer 24 has an impressive range of 5,000 nautical miles. The yacht is propelled by an economical diesel-electric pod drive that takes up less space than the conventional shaft driven system. This innovative system is capable of taking her to a top speed of 13 knots. The garage houses a Williams 445 tender, while a SeaDoo RXP personal watercraft is carried on the foredeck. This layout frees up space for a large beach club area and sauna next to the bathing platform. Three cabins for the owner and guests are set amidships for comfort during voyages. Drettmann Yachts has had great success at the Düsseldorf show in the past. The Elegance Series was introduced in 1998 with seven sales at the show while Bandido yachts were a success at the 2007 show, with one yacht being sold before the show had even opened.